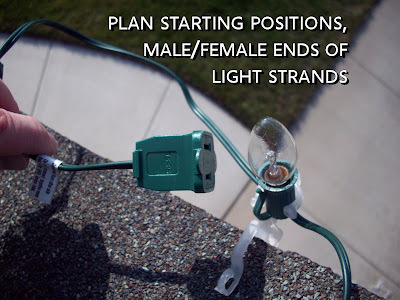 How to Put Up Holiday Lights! It’s that time of year men (and ladies). It’s the time when we go all out in the unwritten, unsponsored, but extremely important competition to out-do the neighbors with holiday spirit … we do this, of course, with outdoor Christmas decorations and lighting. 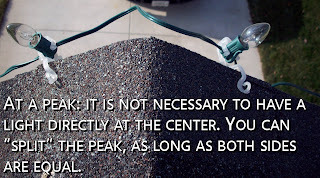 In this post, part 1, I will explain some of the basic materials and preparation, as well as my own philosophy in the matter. I am not a fan of sloppy, floppy, multi-colored-1980s-looking Christmas lighting. 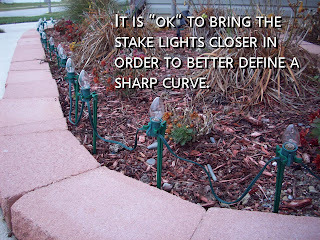 I prefer my outdoor lighting display to be clean, neat, well-ordered, methodical and classy. My setup is made completely using C7 (medium-sized) clear lights. Each C7 Christmas light is evenly spaced and laid out logically so as to keep power cords and plugs hidden from view. In short, I want my display to be “tight,” and not look like an old, burned out Ferris wheel at a strip-mall parking lot carnival. Interestingly enough, my method also makes putting up and taking down the display much easier year after year. (1) 10 sets of C7 clear lights. The best place to get them is online suppliers where they are about $5 per set. (2) 4 packs of stake clips and 6 packs of ’shingle and gutter’ clips. (4) 2, 3-plug solar-sensing outlets with on/off timers. These save you from having to trek out in the cold at night before bed to turn the lights off. The above supplies will cover most houses, front and sides. 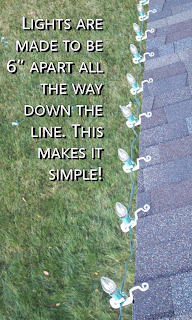 This basic setup is designed to highlight your roof-lines and your bed-lines on the ground. (4 sets for the ground, and 6 sets for the roof.) The cost of these supplies is around $155 total. Keep in mind that it’s a one-time investment that will last several years. Here is where you can save yourself some bigtime headaches. 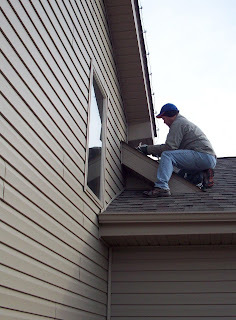 Preparing a good plan keeps you from having to remove and re-position clips while you are up on the roof. 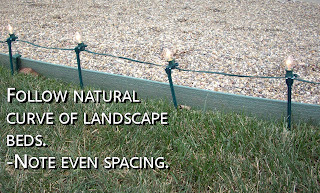 It will also help you make the most of your extension cords and power source. (1) Make a generic drawing (bird’s eye view) of your property with some basic measurements. 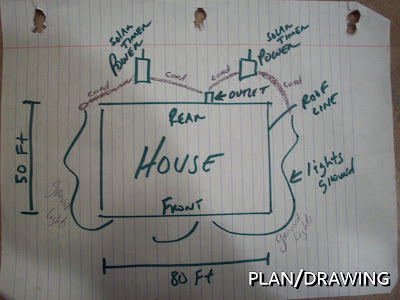 Identify your power source (hopefully at the rear of the house) as well as where your solar power strips will be, and how your cords will run to them. Also keep in mind that you can only string 4 or sets together or you will blow fuses (see instructions on box) This will effect the way your layout your lights. (2) attach clips to lights. 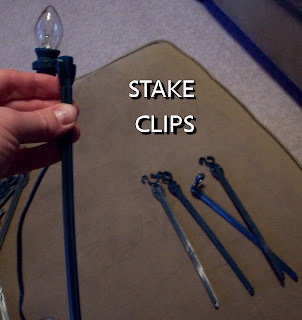 For the stake clips on the ground, attach them whichever way you want, just do every light the same. Important: every light gets its own clip. We do not want any sags in the line. 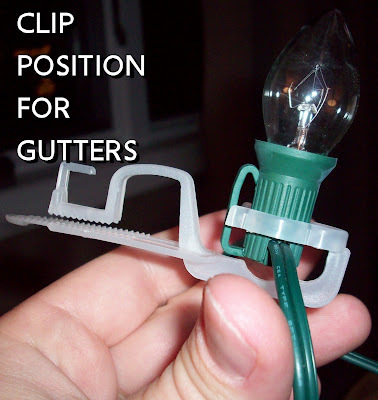 For the roof and gutter clips, you need to go outside and visualize how the clips will attach to the roof. Do you want your light facing up or down? You also need to decide where to start and if the starting end will begin with the male connector or female connector. It helps to go on the roof and place a few clips to see your options because clip positioning varies depending upon if you start your strand with the male end vs the female end. 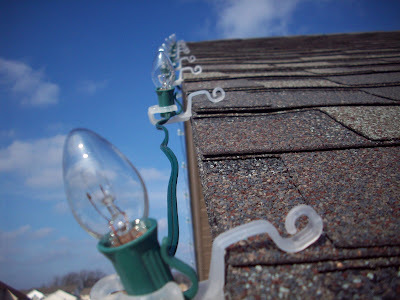 Once again, with the roof line lights, every light gets a clip … no skipping! 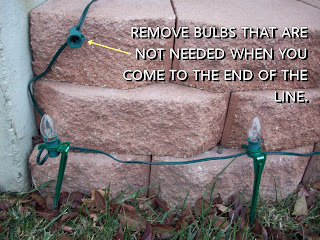 (3) gently tighten all the lights in their sockets as you attach the clips. You can get great pricing and selection on holiday lighting and display here.